The Dragon is feared or revered depending on the culture that has fashioned him. In the West, Western Europe in particular, he has been depicted as a “scaly and horned dinosaur-like creature, with leathery wings, with four legs and a long muscular tail. It is sometimes shown with feathered wings, crests, fiery manes, ivory spikes running down its spine and various exotic colorations.”[i] He has also been depicted as a fire-breathing and winged creature. The dragon may also be the Old English wyrm, the Old High German wurm and the Old norse ormr, i.e. a serpent. In Finland, he is the ohikäärme or salmon-snake. The European dragon may therefore be a serpent-dragon. But whatever his appearance, he symbolizes evil and, in the past, those who killed a dragon were often beatified. Moreover, according to Brewers , “[a]mong the ancient Britons and the Welsh” the dragon was the “national symbol on the war standard.”[ii] The dragon appears in heraldy as do the zoomorphic, transcultural and fabulous phoenix, griffin and unicorn and each plays a different role. In heraldry, the dragon may embolden the warrior or the jousting knight. The origin of the word dragon is the Greek word drakōn. The word drakōn is related to the word drakos or ‘eye’ and in Greek mythology a serpentine and hundred-headed dragon named Ladon guarded Hera’s garden, the garden of Hesperides, tended to by four nymphs. In its orchard, one tree produced golden apples that bestowed immortality or godliness, hence Ladon’s uninterrupted vigilance. The serpentine Ladon never slept. In the Middle Eastern World, where snakes are large and can kill, the serpent-dragon was “a principle of evil”[iii] and as dreaded as he was in Europe. 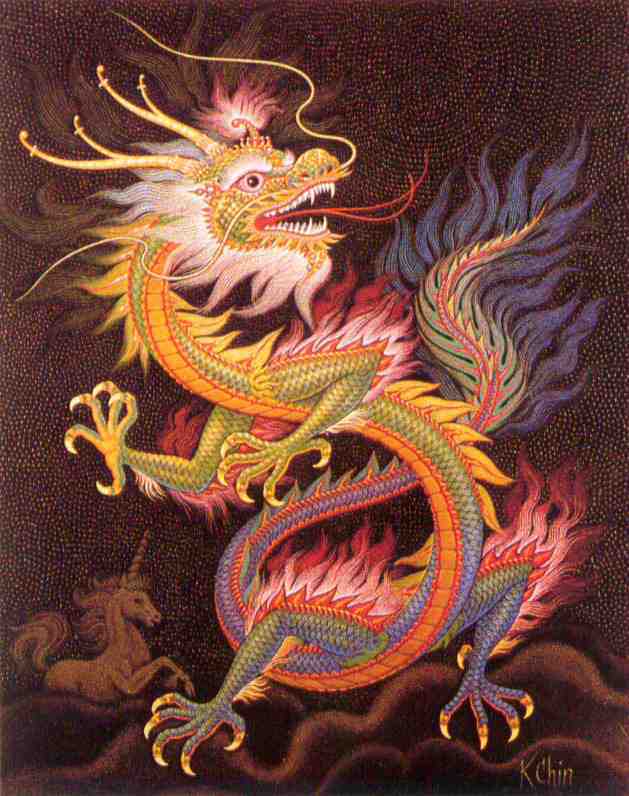 However, the Chinese Dragon, who is usually depicted as a serpentine creature with four legs, “symbolizes potent and auspicious powers.” He is strong and, given that he has control over water, rainfall, hurricane, and floods, he is a symbol of power. Moreover, he also symbolizes good luck and in yin and yang terminology, a dragon is yang and complements a yin fenghuang (“Chinese phoenix”). As well, in the orient, not only is the dragon architectural, as is the gargoyle, but he is used for decorative purposes. He adorns cloisonnés, vases and entire walls. Yet there exists a serpent cult and the feared dragon has also been viewed as protective, which makes perfect sense. If the dragon can inspire terror, he does so universally. He is therefore a good protector. 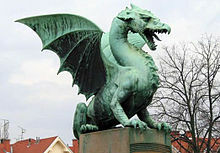 Such was his role as Ladon and such is the role given the Ljubljana Dragon. He is a protector and is featured in the city’s coat of arms. Moreover, if he is protective of a community, in 1898, ten years before he published The Wind in the Willows (1908), where Mr Toad is Toad of Toad Hall, Kenneth Grahame (March 8, 1859 – July 6, 1932) had published The Reluctant Dragon, a story included in Dream Days (1898). So there has been a rehabilitation of the dragon and, for that matter, of several formerly frightening animals: the toad. Furthermore, the dragon belongs to the grotesque which makes him a permanent denizen of the imagination. During certain periods, the grotesque has been a main feature of art, literature, architecture and decoration. As we have seen the drain-spouts of Gothic cathedrals were gargoyles and, therefore, dragons or dragon-like. In fact, the medieval bestiaries featured quite a ménagerie of zoomorphic animals. So even when the grotesque is not fashionable, it simply lays dormant. For instance, there was a Gothic revival in the nineteenth century and, consequently, a revival of the Grotesque. Victor Hugo championed the Grotesque and created Quasimodo, the hunchback of Notre-Dame. Let us recall, moreover that, in Beauty and the Beast, Beauty falls in love with Beast as Beast. She does not know that the moment he is loved, Beast will turn into his princely self. So there may be room for beings that one may at first consider as repulsive. * Novalis was born Georg Philipp Friedrich Freiherr von Hardenberg (2 May 1772 – 25 March 1801). [ii] “dragon,” Brewer’s Dictionary of Phrase and Fable, revised by Adrian Room, 16th edition (2001). [iii] “dragon.” Encyclopædia Britannica. Encyclopædia Britannica Online. Encyclopædia Britannica Inc., 2012. Web. 04 Feb. 2012. 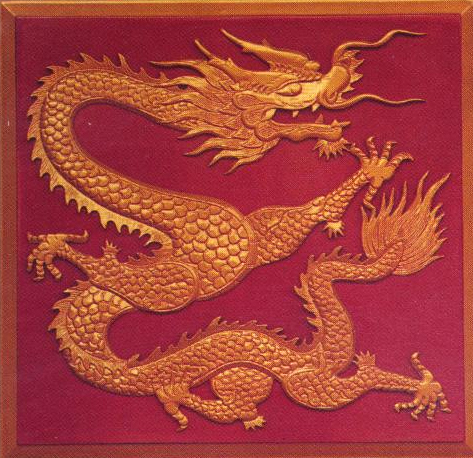 <http://www.britannica.com/EBchecked/topic/170779/dragon>.